He may be abominable but he sure is cute! Fuzzy and fun and never unpleasant. 100% natural wool. Comes in Adult and Kid's sizes. 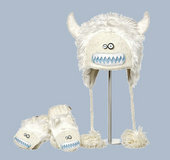 Match with the Abominable Hats.